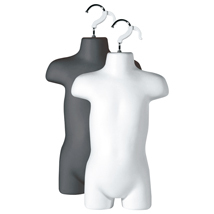 Premium hard shell half round fashion forms include metal hook for easy hanging. Our half round forms feature a hollow back for easy styling. Fits 2T - 5T toddlers clothes. Hook is removable.